We entertain children with soft play spaces that are specifically geared towards their natural sense of curiosity and adventure. We create amazing soft play spaces specifically for babies, toddlers, and preschoolers! As parents ourselves, we understand that a young one’s sense of exploration is often matched only by their indifference to safety limits. So while our colourful and fun soft play spaces inspire imaginations and entertain your little ones for hours, they also create a clean and safe area for them to play – now the adults can enjoy themselves too! Up to 4 hours of play, a shoe rack, fencing where necessary, extra thick foam safety flooring, installation & tear-down! Don’t see quite what you’re looking for? We love working with clients to create tailored soft play spaces that match their party & event needs perfectly! Call or email us to see what we can build for you! 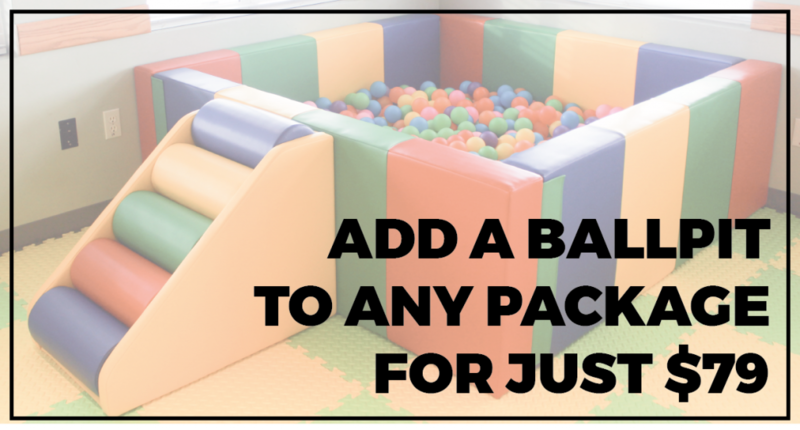 Sharing is caring – but not when it comes to germs – that’s why we clean our ball pit balls between every party! It’s part of Sprog & Sprocket’s We Dream Of Hygiene Promise! 4 hours not enough time to play? We understand, we don’t like when the party ends either. We are happy to accommodate longer rental times. Please contact us here or call us on 403 719 7776 so that we can discuss your individual requirements. Perfect for birthdays, weddings, corporate family days, playgroups, and anywhere else you need to entertain those energetic little ones and keep them out of trouble! …Similar to our Portable Playgrounds, our toddler soft play spaces are suitable for indoor or outdoor use (weather dependent, of course!) and we take care of all the set up and collection. We have lots of flexibility with how we can configure the set up which lets us take advantage of spaces in many shapes and sizes. Questions? No problem! Check our F.A.Q’s page or get in touch!